Team USA has now been here for 9 days, and we have only slid once. At this point we were supposed to have 10+ trips down the track, but due to a track repair needed we have only slid one day for one run (in a training session you normally slide 2-3 times). The cool part is, I slid that one run. It makes it special for me because I slid with the USA 1 Pilot Elana Meyers Taylor. Latvia has not held a World Cup race in about 12 years, so this was the very first time Elana has slid this track as well. There is not a lot Elana has not done in the sport of bobsleigh (3x Olympic medalist, 12-year veteran) so to be able to say I took her first trip in Latvia was special to me. It is always nerve wracking to go down a new track for the first time, but it made it even scarier knowing my pilot had never slid this track either (which is very rare). During my warm up, I was extremely giggly because I was that scared and sometimes the only thing I can do when I feel that nervous is to laugh. My job as the brakeman is to make my pilot feel confident, so I had to put my nerves aside and put on my armor of faith to slide. Elana is one of the best pilots in the world which gave me confidence. If I’m going to slide a new track, I am thankful to have a top pilot take me (the slide went amazing by the way). The other thing that helps me to overcome this fear is to pray for others. I start to pray for people who would give anything to walk, stand up, or get out of a hospital bed. This helps take the focus off me of being scared and hopefully using it as a prayer to help or bless others. I never want to take what God gave me for granted but to use it fully to thank Him. Scary things do happen in bobsled all the time. Going 75-95 mph down an ice tube creates that danger and the only way I am able to do this and have fun is by completely trusting that Jesus will protect me. Anything that would happen would be with His permission and ultimately be part of His plan so I don’t walk around with that fear. Saying that, 2 people after our slide had kind of a freak accident. There are 16 curves at this track and in curve 15, the sled hit the lip of the roof and it tore the back runners off (where the brakeman sits). Our coaches were not comfortable sliding until it is deemed safe by the Federation, so that is why we have been waiting for the clearance to slide. Races are this Friday. I will not be racing but I believe Jesus will provide other opportunities to race. At this point, I am so thankful to be on the team, traveling the world and representing the USA. This week, I will stand with gratitude in my heart and cheer on my teammates. I prayed long and hard to make the World Cup team, so I am determined not to let the devil steal my joy. Thank you all who have teamed up with me to make this possible. You are in my prayers daily and I know blessings will come back to you the way you have blessed me. The start ramp at the track is built up 7 stories high (see picture above). Paldies (PAL-des) means thank you in Latvian. Our sleds are kept in a conference room at the hotel. We take our sleds up an elevator to get to the start ramp here in Latvia. We transport our sleds in a big cargo van, which is a manual. One of the first days here, one of the guy athletes took me to re-learn and freshen up on my stick shift driving! It was only in 1991 that Latvia gained its independence from the Soviet Union. I was born in 1989 which gives it reference for me! ​On December 10, we fly from Riga, Latvia to Frankfurt, Germany where we will drive 2 hours to Winterberg, Germany. Elana is racing 2-woman and also 4-woman at this spot. I will most likely be racing in the 4-woman race which is exciting! More to come from Germany! How did you get involved in bobsledding? I was listening to a Christian radio station and I heard the story about Vonetta Flowers and how she went from missing the Olympics in track to bobsledding. This story sparked my interest and then I looked on USABS.com and saw there were combines to try out for bobsled each summer, and the rest is history. What is your daily workout routine? Do you grocery shop or do they provide food? What is your diet like? The only thing I go grocery shopping for is sparkling water. :) The Olympic Training Center provides all the food. If you’re not careful though, it’s like college all over again where you can gain the ‘freshman 15.’ To be honest, I go in spurts of being really strict and then not strict at all. When I am on top of my game I eat a TON of veggies, lean protein, whole grains and spinach smoothies. If you need to default to something, default to cooked, steamed, grilled veggies with marinara sauce, you’ll be surprised by how delicious it is. Where on your travels has been your favorite place to visit? This is hard to pick because everywhere we go is beautiful. There are only 16 tracks in the world, so a lot of them have held winter games at their site. Whistler, Canada was breath taking and then La Plagne, France because the drive there was through the French Alps. I’d also say St. Moritz, because everything about St. Moritz is perfect. How fast is the bobsled moving? How many G-Forces are you pulling on the curves? What do you wear under your speed suit (uniform)? Depends if my pilot and I are close to making weight or not… LOL. If we are a few kilos over the night before, I wear only my burn vest. If we are under weight, I will wear a sports bra, burn vest and spandex. How does your faith sustain you in these times? Both in struggles and joys? My faith is the only reason I can do any of this. Through experience, I am starting to appreciate the struggles because I know God is STILL in control and it makes the joys even sweeter. I’ve also found that the harder it gets, the greater the reward if I turn it to God. I heard this one time and also remind myself that Satan is going to try and stop me in every area of my life because my main goal in life is to take people to the kingdom with me, and I know that he’s trying to stop me because that is opposite of his plan. In the joys I just say ‘thank you God’ continuously, I even cry most times because the joys are that sweet. In the struggles I often cry too but I go back to my foundation and that is reminding myself the promises in the Bible, and how He works all things out for good, and with that, I am able to continue on. How do I become an Olympic bobsledder? How busy are you as a bobsledder? Depends. Some athletes are full-time athletes and some athletes also work. 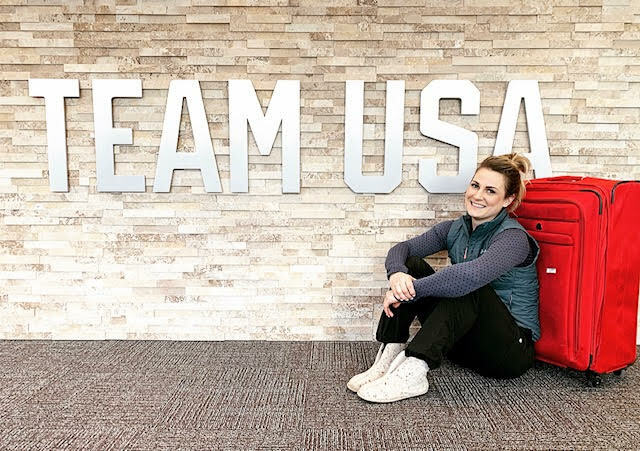 Personally, I was used to working full time and then training so when I moved to the Olympic Training Center to strictly train, I found myself with more free time than I was used to (even though a days worth of training can be anywhere from 2-8 hours a day). I got a job as a part time barista 4 mornings a week so I keep busy. How do you train your MIND? What are your favorite books, podcasts or other methods for mental toughness? Getting my mind right is a daily requirement. 1. My journals. I read them to remember and remind myself how faithful God has been through all my struggles and to see prayers answered that I prayed for back then! 3. The Circle Maker by Mark Batterson. It’s a book about praying for BIG things and believing to see them come to pass. 4. F* Your Feelings by Ryan Munsey. I just started this. My oldest brother called and said I need to Amazon Prime it ASAP. It’s about the mental toughness of Navy Seals and the best athletes in the world. 5. The Bible. Recently really focusing on the book of Daniel. 1. Joyce Meyer. I listen to her messages whenever I go on a walk and most times while I get ready in the morning to start the day out with beating the battle in my mind before it starts. 2. Steven Furtick. Pastor out of North Carolina. Incredible messages. How do you prepare before a race? What is the most critical thing you have to do to get maximum speed? The most important thing I do before a race is mentally prepare. I visualize the track and its curves in my mind, along with my start. The sled picks up speed on the track mostly by how the pilot drives, but as a brakeman (which I am), it is pushing the sled the fastest at the beginning of the race. What are some of the biggest challenges you’ve had to overcome on your journey? This year I have been challenged with feeling that I am not ‘enough.’ I had feelings early in training that I wasn’t fast enough, strong enough, technical enough, young enough and so on. I may not be enough in some areas but I know that God opened this door, brought me down this path, so enough or not, something good will come from it. What are you favorite and least favorite tracks, and why? Is Cool Runnings a motivational movie or comedy to the team? Is it your favorite? Is it a requirement to watch it? Have you ever chanted “Feel the Rhythm! Feel the Rhyme!” In your head before a race? I will say that is one of the most popular questions we get (questions about Cool Runnings). No, it’s not my favorite movie but I did watch it for the first time last year and got goose bumps, but not a requirement to watch (ha!). I have never said that phrase before a race because in the moment I am thinking about way more than Cool Runnings… LOL! 365 days ago, I was listening to Pastor Joel Osteen radio on Sirius XM 128 and I heard the story of Vonetta Flowers (American bobsledder) which planted the seed of bobsled in my heart. I remember exactly the moment I heard it (I was at the stoplight at 168th and Maple in Omaha, NE, going to my brother’s house) and I also remember the season I was going through at that time. I’ve always heard the devil fights hardest when you are closest to your breakthrough. Well, I 100% agree with that. I was in an absolute state of survival at this point in my life. The devil had been attacking me from every angle. I felt stuck, alone, confused and hurt for a few months before this, and especially the two weeks prior to hearing this message. The only way I got through the day was waking up and listening to Joyce Meyer, Christian music and Joel Osteen radio while I drove, podcasts during work and phone calls with my mom. I had something encouraging playing the whole time I was awake, it was the only way I got through the day. Looking back, if I hadn’t been going through all that, there is a strong chance I wouldn’t have been listening to Pastor Joel that Tuesday evening in my car. I listen to Joyce, Joel and Christian music anyway, but since it was an absolute necessity at this point in my life, God was making sure I didn’t miss this! Little did I know in that moment, my life was going to completely change. I didn’t win a gold in the Olympics, but I got to live a life I couldn’t have even dreamed of - and still am. I am so thankful (now) for that tough season I went through. During that season I felt like things were never going to change and I was convinced my dreams were bigger than Gods plan. Today, 365 days later, I am reminded that Gods ways are so much higher than mine (Isaiah 55:8-9). I couldn't find the broadcast message that I heard on the radio, but I found the article on JoelOsteen.com that is pretty much the same thing as I listened to a year ago today. I hope this message encourages you: You Can Trust God’s Faithfulness by Joel Osteen.